I passed the Microsoft 70-417 exam today; it wasn’t my first attempt. I don’t pursue many Microsoft certifications because I find them to be of questionable value. The use of braindumps is rampant in IT certification, particularly true in the case of Microsoft exams. I feel this is in part due to the ridculous nature of most of the questions. There are always going to be people who simply don’t want to learn, the so-called “paper MCSEs”. But unlike exams from other vendors such as VMware and Cisco, experience with Microsoft’s products has nothing to do with passing their exams. Microsoft’s inability to write decent exam questions is truly baffling to me. I had many questions that forced me to try and remember where in the GUI certain options were. As an example, think about the advanced NTFS permission list. 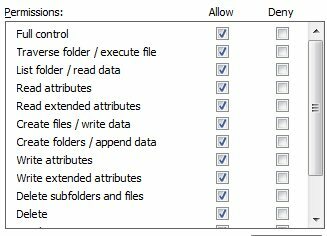 Is “Create files / write data” before or after “Create folders / append data” in the permission list? You probably don’t know and you surely don’t care. If you do happen to know, it doesn’t make you a better administrator. It doesn’t demonstrate much of anything other than a photographic memory. The 417 exam is loaded with these kinds of worthless questions. Even worse is trying to remember a particular switch for a PowerShell command – that’s why cmdlets are self-documenting. The 70-417 exam is divided into 3 parts, the 70-410 (Install and Configure), the 70-411 (Administering) and the 70-412 (Advanced). My exam had 61 questions and you have to take each section invidually. Once you complete a section, there is no going back. I would never have passed this exam without J.C. Mackin’s Exam Ref 70-417: Upgrading Your Skills to MCSA Windows Server® 2012 and Timothy Warner’s 70-417 videos on CBTnuggets. I’m normally proud and excited when I pass an exam, but not this time. I mostly feel anger toward the Microsoft Certification team for wasting my time. The exam hasn’t measured my actual skill with Server 2012, all it’s done is measure how well I can remember trivia. I’m happy to have this one behind me. I doubt I’ll look at any more Microsoft exams until this MCSA expires. This entry was posted in Windows Server, Windows Server 2012 and tagged 2012, 70-417, certification, exam, MCSA by pkremer. Bookmark the permalink. I’ve failed 70-417 3 times now. Previously attained MCSE in 2003 and MCSA for 2008 server. Read and studied (3 times) Mackin’s “Upgrading Your Skills to MCSA Windows Server 2012.” Used ActualTests VCE and PDF and TestKing PDF to prepare. On each exam though about one third of questions I had never seen, such as multiple questions about creating a DC in Azure and fine-grained details about DirectAccess configuration. Wish I could find better prep material. Took the 70-417 today, wasn’t prepared for it, i had booked it months ago, but hadn’t had much study time (having an 8 week old baby around means zero study time), so i called to re schedule yesterday, was told i had to give 24 hours notice (i was giving 23 hours and 50 minutes notice). So after getting over the frustration that i was probably going to fail. I went in with a nothing to lose mind set. Failed 70-417 today, too. Coming from an MCITP:Enterprise Messaging 2010 certification and a lot of concept writing and hands-on experience with Exchange 2013 on Server 2012(R2), I thought I knew enough of Server 2012R2 to pass. Also learnt using Mackins book, but still no luck, Epic Fail, all three topics far under 700. I really do not understand the need for IPAM configuration, NPS and storage cluster/hyper-v cluster questions in the way they were asked. It is not only the topics itself – I do not need to know about DirectAccess or NPS in detail for an Exchange consultant, I actually don’t care for Hyper-V Failover szenarios – but the way the questions are designed. Especially PowerShell questions – I really don’t know any server admin who might be able to recall more than 10 PS cmdlets used for IPAM, NPS or Device Registration if he is not working with it every day. I am really angry about this exam – Exchange 2010 exams were fine the way they were and at a passed exam least proved you understand how Exchange is working in detail. I agree with the comments here. I decided to try and upgrade my 2008 MCSA after completing an Exchange 2013 Cert and thought I was well prepared, but failed quite badly. Following the recommendations, I used the jump start MVA video’s which were weak on detail and ok for an overview. The study guide, to be fair was quite good, however the scope and type of questions are things I rarely if ever use in my daily job. To be frank, the motivation to continue down the Microsoft track has taken a big hit and the though of having to go through that again is daunting. It doesn’t help when you consider “what I am really achieving?” other than some numbers on a website. I’ve been in IT for many years and like most others, I research things as and when needed, simply regurgitating facts on the day and then forgetting it six months down the line is almost pointless. I just took 70-417 today and I agree entirely with everything you said. I didn’t pass it, but my company pays for my tests so it wasn’t as big of a deal. Where I work, I mainly focus on System Center Configuration Manager 2012, SQL, some PowerShell and the core functions of the Windows Server. This exam essentially tells you that if you aren’t doing ADFS, NAT, Hyper-V cluster, DirectAccess, etc. then you aren’t a real Windows Admin. Nonsense! I agree with the other comments. This test is a joke. It’s a gauntlet you have to pass through to get those letters after your name. Given the structure of the test, I don’t wonder that people use braindump sites. It’s just a game to get MSFT some extra money. If it weren’t, then it would be an honest real-world test. For example, look at how Cisco does its tests. Some of the harder ones out there, but very fair and they test the core skills that everyone uses. As for the other person above commenting on AD DS vs. AD FS and AD LDS on the exam…EXACTLY! AD DS had fewer questions than AD FS. What a crock! Today, I passed the Microsoft 70-417 in 1 shot, but it was dammed close. On 1 topic my score was 700 just enough to pass. I have a long MS certification path starting from MSCE back in 2000… This exam is the most ridiculous one I ever taking. As you state it, i’m normaly also proud when I pass an exam. I feel the same anger toward the Microsoft Certification team for wasting my time as you. I had more questions of ADFS or ADLS that no-one uses rather than question around Active Directory, that almost every company have in place. I had no questions of DHCP and DNS, but a whole bunch of questions regarding fancy NPS setups, or questions regarding direct access. Does Microsoft really thinks all companies have an IPV6 network in place ? What a joke ! I couldn’t agree more. Microsoft’s exam format is unfortunately very out of touch with the real world, particularly if you work in a large enterprise. You can fail a test on something that you would never use in the real world (RRAS for example) and moreover, not on the concepts but on memorising the GUI’s. Gathering the motivation to study for a Microsoft cert is one of the hardest things for me, however, gathering the motivation to learn and understand the technology has never been a challenge.